The SGI Summer school for teenagers at stunningly beautiful Ardingly College in the English countryside has been a fantastic success in July. During, August, because of a late cancellation there a couple of places available for your child to come and learn English with the super SGI teachers - in fact, SGI is continually rated by the UK government as having 'excellent teaching'. At Ardingly College, the SGI course has 20 hours of English lessons every week filling up the morning timetable. After lunch in the school restaurant, there are sport and social activities to make the afternoons fly by. However, as all activities are carried out in English this is an extremely effective way to improve English skills in a relaxed social environment. SGI summer school in London for adults always has a rich mix of students from all over the world coming to the capital city to improve their English, experience British culture and make new friends. Likewise, the SGI Junior Summer School has a similar spread of nationalities. 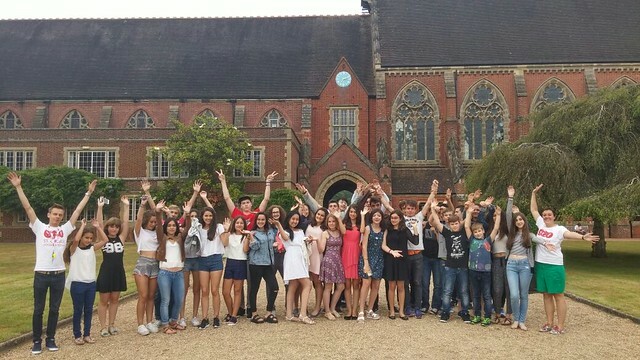 In July, Ardingly College saw SGI students from France, Brazil, Kazakhstan, Russia, a large group from Spain, Poland and Hungary. There will also be a wide range of representatives from many nations in August... all speaking English together and making new friends. In fact, when the boys from France and Brazil went home in the 3rd week of July, the SGI teachers noted that there were lots of SKYPE calls to them from the Spanish girls afterwards: ahhh, those first teenage crushes are so important! Every week there are two excursions away from the school grounds to local cities and places of interest outside of London. The teachers have taken the students to London, Brighton, Cambridge and Hever Castle; a 13th Century Castle in the country of Kent. The SGI teachers get all the students involved in sport during summer school. Ardingly College has amazing sport facilities, including a swimming pool, sailing lake, 16 tennis courts a sports hall and enormous playing fields, so we are putting them to great use. People have been playing football, basketball, tennis, rounders, rugby, volleyball and going swimming. In addition, there have been non-sport activities such as drama, dance classes and even Tai Chi. For the more artistic children, teacher Melissa has been leading classes in portrait drawing, origami and making necklaces.